Munster's Heineken Cup hopes have suffered a blow after Peter O'Mahony was ruled out for the rest of this season by a shoulder injury. The Ireland flanker, 24, suffered the injury in Munster's European win over Toulouse last weekend and was scheduled to have an operation on Wednesday. 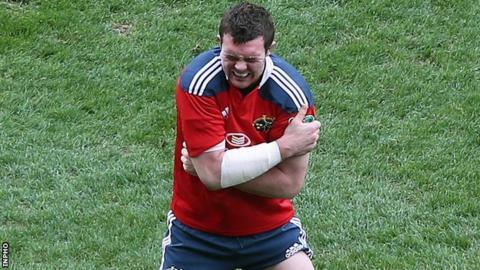 A Munster statement that O'Mahony's left shoulder would undergo "reconstructive surgery". O'Mahony will also miss the Irish province's Pro12 run-in. Rob Penney's side are on course for the Pro12 play-offs as they sit second in the table, five points behind leaders Leinster. Casey Laulala should be fit for the European semi-final against holders Toulon in Marseille on 27 April after being ruled out for two weeks. The All Blacks centre, who will will join Racing Metro at the end of this season, suffered a broken knuckle in Saturday's quarter-final. Leinster's Fergus McFadden will also miss several weeks of action with a medial knee ligament strain, but should return to action before the season's end.